JBL 705P leverages next-generation JBL driver technologies to deliver greater dynamic range and superior frequency response. The 2409H high-frequency compression driver incorporates an innovative low-mass annular diaphragm to deliver smooth response beyond 36 kHz, with very low distortion. The 725G low-frequency transducer provides 14mm peak-to-peak excursion with greater linearity, delivering exceptional low-frequency output below 39 Hz. These proprietary drivers allow the 705P to deliver two to three times the output of existing studio monitors. The JBL Image Control Waveguide ensures accuracy and neutrality while providing a wide sweet spot with increased sonic detail. By enabling an acoustically seamless transition between the low- frequency and high-frequency transducers, the waveguide provides a detailed soundstage and accurate imaging across the entire frequency spectrum. The smooth, on- and off-axis frequency response allows the JBL 705P to deliver neutral response across a wide listening area in a broad range of rooms. JBL 705P features a built-in dual amplification system that’s optimized for its high-output drivers. A 250W amp powers the 2409H high-frequency transducer and a 250W amp is dedicated to the 725G low-frequency transducer. This combination provides exceptional output and allows for greater listening distances, making them ideal for post production or mastering environments. JBL 705P features analog and digital inputs and sample rate converters. AES/EBU digital inputs allow connectivity with a broad range of production hardware, including digital audio workstations (DAW), mixing consoles and digital playback hardware with sample rates of up to 192 kHz. Internal sample rate converters can be enabled to allow connection to digital signals with uncommon sample rates. The JBL 705P is the self-powered reference monitor for critical music recording, film post and broadcast production applications. The JBL 705P leverages the same patent-pending driver technologies and JBL’s renowned Image Control Waveguide found in the 708P and the flagship M2, but with a smaller footprint. Despite its compact size, JBL 705P delivers an eye-opening level of output, well beyond that of existing, comparably-sized studio monitors, for greater dynamic range and greater working distances. 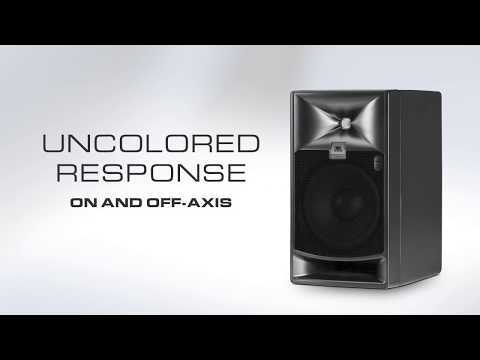 The speakers deliver an expansive soundstage and pristine accuracy in a broad range of rooms.